The Galway City Council has secured funding for a major flood defence project for the city. The announcement was made by Galway city Mayor Pearce Flannery following an emergency meeting on Wednesday morning at 7am between the OPW Minister, Kevin ‘Boxer’ Moran, an senior executives of the city council, and councillors. The news comes after the city experienced some of the worst flooding in years on Tuesday night when Storm Eleanor made landfall. Mayor of Galway city, Pearce Flannery, said that he was delighted that the OPW Minister, Kevin ‘Boxer’ Moran, had given an absolute and unconditional commitment that priority will be given to a major flood defence project for Galway city. 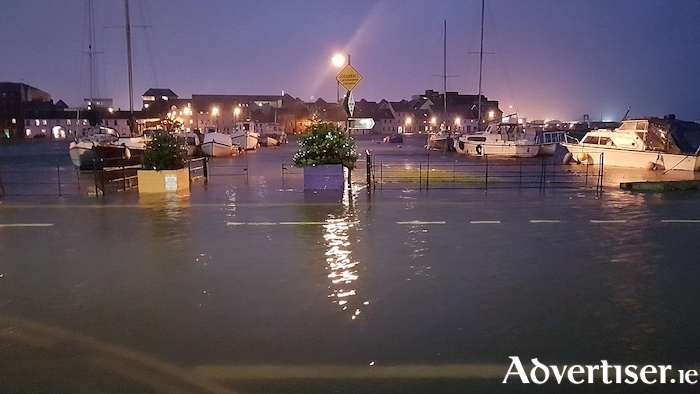 Speaking to the Galway Advertiser, Mayor Pearce Flannery said; “I asked for and was given an absolute commitment that following the flood risk impact report that Galway would be given the highest priority for funding for measures to mitigate against flooding on such a scale ever happening again. “I advised Minister Moran that climate change is here and now and we are going to experience many more events such as this. The first one was unprecedented but we are now under notice that we can be impacted upon so quickly without notice. We are a city surrounded by water and we need to be prioritised when it comes to defence funding. To the Minister’s credit he agreed with my position and quickly confirmed that Galway would get immediate priority. Despite the allocation of funding and city chief executive, Brendan McGrath, saying nobody could have foreseen the level of storm surge, city councillors have criticised the local authority for failing to adequately prepared for the devastating flooding. Fine Gael councillor said that there was no excuse for the city council to be so ill-prepared for the floods, claiming the warning signs were there and the city should have been put on high alert. Cllr Farrell said, “There can be no doubt that global warming is playing a serious role in the increasing levels of flooding, but at a local level we need to put ourselves in as strong a position as possible to respond immediately to these types of occurrences. We need a full review in to how this can be achieved. As a result of the speed and the unexpected scale of the flooding, the Government is providing support to help those affected by the flooding, Minister Sean Kyne revealed. Deputy Kyne said, “Minister for Defence, Paul Kehoe has confirmed to me that a Humanitarian Flood Scheme has been launched which will be administered by the Irish Red Cross. This is a contribution by Government of up to €20,000 towards repairing flooded premises and includes the replacement of flooring, fixtures and fittings. The scheme is targeted at small businesses (up to 20 workers ), sports clubs and community organisations that have been unable to secure flood insurance. “The first stage of the scheme will start immediately and will provide a contribution of up to €5,000 to help with clean up and repair. In cases of signifiant damage a second phase of funding with further support of up €15,000 will also be available.